When Lids for Kids – Michigan’s annual bike helmet giveaway – first began, Sinas Dramis Law Firm reached out to Origami Brain Injury Rehabilitation Center, knowing their deep commitment to education and prevention of brain injuries in the community. We’ve proudly partnered with Origami 2003 and appreciate their support and involvement. We recently spoke with Yvonne Fleener, Business Development Manager at Origami, about how they’re making bicycle safety helmets a thing your child is excited to wear. Hi, Yvonne! Can you tell our readers a little about how Origami got involved with Lids for Kids? Of course! At Origami, our mission is to find new ways to educate the community about brain injury prevention, and we know that bicycle safety helmets are one of the most important measures to keep kids safe. So, when Sinas Dramis Law Firm approached us about this incredible event, we jumped at the opportunity to get involved. Lids for Kids is something that Origami is very passionate about, and it just keeps getting bigger and bigger every year. For instance, last year, there were 15 Origami volunteers at the Lansing event. This year, we already have 32 volunteers signed up. Everyone loves Lids for Kids around here! That’s incredible! Tell me a little bit about what Origami actually does at the event itself? Beyond volunteering to man booths and fit kids with bicycle safety helmets, we have brought Sparty to Lids for Kids in the past, as well as started a helmet decorating station last year, which was such a huge hit with the kids. Describe the bicycle safety helmet decorating station. It sounds like a lot of fun! And that’s when I came up with the idea of decorating the helmets. Disney’s Troll movie was huge this time last year, so I bought bright colored fake fur from the craft store. We had kids gluing furry mohawks to their helmets, others who took a lot of time to paint theirs, decorate with stickers, you name it. 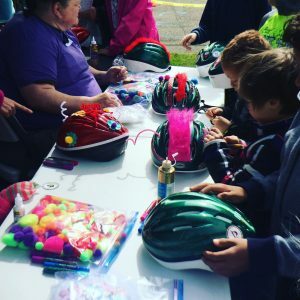 We are all so busy, so seeing families taking the time to make these bicycle safety helmets total masterpieces was pretty cool to see. It’s great way for parents to get involved with their kids, and for the kids to flex their creativity and make the helmet their own. And families who maybe had more than one kid in the same helmet size (same color) could quickly tell whose was whose. It was really so much fun! What can attendees expect this year? Stickers, paints, glitter, the sky’s the limit. We try and choose a theme that’s currently popular with the little ones so they’re all the more excited to participate. There’s definitely something for everyone. I can’t wait to see what they come up with this year! Thank you Origami Brain Injury Rehabilitation Services for your involvement with Lids for Kids. We look forward to another great event this year!